There are a situations where you want to fill dropdownlist or combobox or listbox from database table. For that you need to get database table records in to DataSet or DataTable and after that you fill dropdownlist from DataTable. For that we need to set Three properties of dropdownlist control. DataTextField : This is column name of database table which you want to display in dropdownlist box. DataValueField : This is column name of database table which use to identify which item is selected in list. After assigning this properties You need to call DataBind() Method of drop down list. You can also say that fill dropdownlist using ADO.Net. Here are sample example for this. In this example we retrieve "product_master" table data from database and populate in to drop down list. 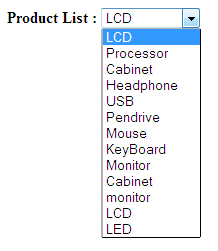 objcmd.CommandText = "Select product_id , product_name from product_master"
You can also fill listbox with same way. This type of C# Tips is very useful in day to day programming life.